Our two Marianist high schools made the journey from Long Island to participate in the annual March for Life in Washington, DC. Over 150 of our students participated plus our graduates as well. 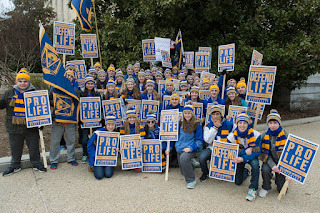 Abortion has been legal for 44 years in our nation.It appears to me that there is a younger generation arriving on their school buses, seeing so many peers who are also Catholic, who also defend life, and who also for the first time realize they’re not alone, not stuck in their local parishes and schools. The numbers that March on Washington are enormous. And the youth are energetic. This is the fruit I’ve seen each year. 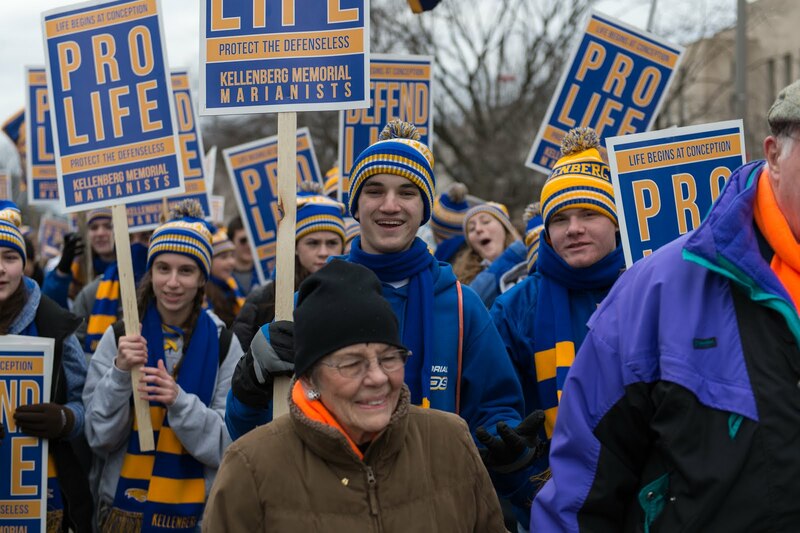 "Every successful undertaking is a triumph of enthusiasm.” And that is what characterized this year's 2017 March for Life, a spirit of enthusiasm. 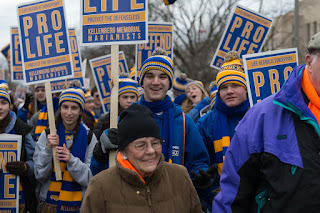 The March for Life does have a political effect: keeping alive the abortion debate in our country, which also keeps in check further abortion legislation. We’d be far worse off had the issue been swept under the carpet years ago and the debate not kept alive. 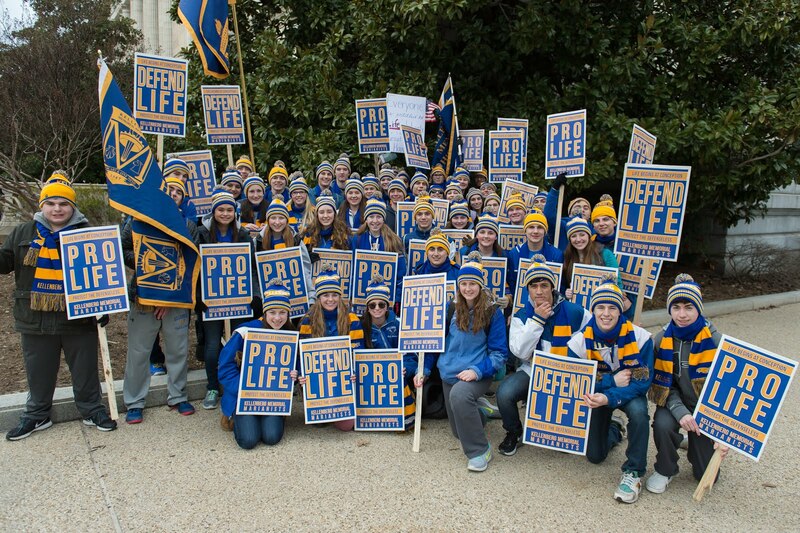 To live life and to defend life. To defend it by living it joyfully. To be Christians in the world, which is the same as to be joyful. Because we know by name He who gave us life and who gives it to each and every person from the very first moment, from His own hand. So, how many times have you heard that if you really want to improve your prayer life you have to start making a Holy Hour? It’s advice that I both get and have received. There is rarely ever an explanation as to why. Why a Holy Hour? Our high schools sponsor adoration. You can do it! You have some time to spend with the one you love. Now do it with God. You may not notice a difference after a day, a week, or maybe even a month. But one day everything will be different and you will look back and wonder at how things have changed. But you have to start. As a consequence of our religious profession, we enter a new family, our religious community. In this religious community, we assume new relationships and responsibilities toward God, our Brothers in community, and the People of God. As a result of our membership in a religious congregation of the active life, we devote ourselves with energy and enthusiasm to the apostolic work of our communities. We devote ourselves, fully convinced that Jesus addresses us just as He commanded the Apostles to go forth and teach all nations. 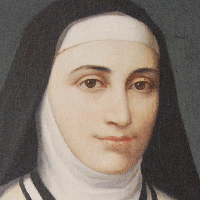 In 1816, Blessed Chaminade, in collaboration with Adele de Batz de Trenquelleon, founded the Daughters of Mary Immaculate (Marianist Sisters). In 1817, he founded the Society of Mary (Marianists.) He saw in these two religious orders the means to maintain, inspire, and extend the network of communities and works founded through his inspiration. 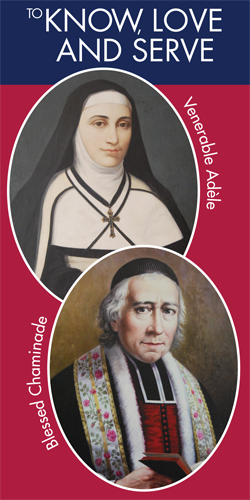 Blessed Chaminade continued the work of developing lay Christian communities. Simultaneously, he directed the Marianist religious into schools that they might become Christian communities of learning. During his lifetime, he founded over forty schools, including three teacher-training institutions. Chaminade perceived these schools as having the mission of enculturation of an essentially religious worldview. Our brokenness is the wound through which the full power of God can penetrate our being and transfigure us in him. What is it in these turning points or experiences of fracture or conditions of brokenness that particularly open us to God’s love dwelling and working in us? When we break the communion wafer we break it significantly into two. But then we go on breaking it into smaller pieces; fragments on a silver paten. It would take some time to put the jigsaw of these fragments back together again. The point is we don’t. Christ isn’t put back together again. And when we are broken neither are we. We can never be the same again. Christ was broken. For us. For all time. And in his actions he took bread and he broke it and gave it to his disciples and said take, eat, this is my body which is given for you, do this in remembrance of me. Being broken is what makes us. It makes us a community, diverse fragments of Christ’s body together making something whole. Expressed by the words we use in Lent at the Eucharist ‘We break this bread, communion in Christ’s body once broken’. It is in our being broken, by life, sometimes by God that new understanding comes. Not a brokenness to be repaired or stuck back together but broken for life, for beauty, for being in the world as his people, like the fragile clay pots, filled with his love. At our weakest, most open to receive the greatest love; his life laid down for us. Because in weakness we know that. When we are not - he is He is the yes, when all around are saying no He is the hope when all feels hopeless He is the life when everything speaks of death He is the wholeness when everything speaks of brokenness. in order to express what we see. Such was the case with Blessed William Joseph Chaminade in regard to the Blessed Virgin Mary. by the way God had taken Mary into His love. We believe in the effectiveness of Mary's presence. We believe that we are called to bring the influence of her presence everywhere. We believe in the power of her presence. We dedicate ourselves to communicate Mary's presence in everything we do. Indeed. everyone of you is a missionary." Here is Bible Geek, Mark Hart as he reflects on how to be a saint. In reality, we are all called to be saints. It is our vocation. And below, ten quick reflective quotes on sanctity. 8. “The saints are the only really happy people on earth.” Fr. John Hardon, S.J. It's your call. You are chosen material, though you might not know it. Most of us spend quite a bit of time shopping around before we finally find, or fall into, a profession that seems to suit our personality. The most popular childhood careers of firefighter, football player, doctor and astronaut are not reflected in the numbers of adults actually involved in those pursuits. Instead we "settle" for jobs that need to be done or are the most available. When's the last time you heard a kid dreaming about growing up to be an office manager or a banker or an electrical line repairer. But all those jobs must be done and done well by someone, if we are to keep our businesses, our banks, our communities and our homes running smoothly. One author put it this way: God often calls us when we are running errands, doing the mundane, thankless chores of life. When we least expect it, we are elected. Moses, hiding out on the back side of the Midian desert, was running an errand when a bush started burning that would not be consumed until he faced Pharaoh. Isaiah was somewhere in the temple, performing his regular priestly duties, when the heavens came down and the Holy commissioned him to go to the valley. Ezekiel, performing his pastoral tasks in the Exile, was transported by divine limousine service to a valley filled with dry bones. Amos was out herding sheep and keeping sycamore trees when the voice came and compelled him to go to the valley. And, Andrew and Peter were fishing out on the Sea of Galilee when the Master called them from fishing to the valley. God is calling you right now. Are you going to respond? It's your call whether or not to accept your "call." 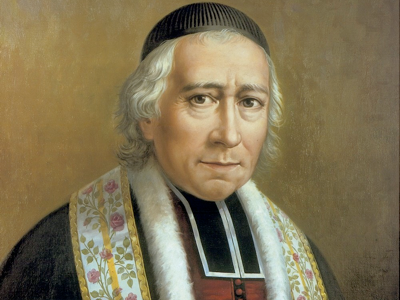 Years ago, the Holy Father spoke of Blessed Chaminade's beginnings in Bordeaux in this manner: "In 1790 after the outbreak of the French Revolution, he moved to Bordeaux, where he spent most of his life. 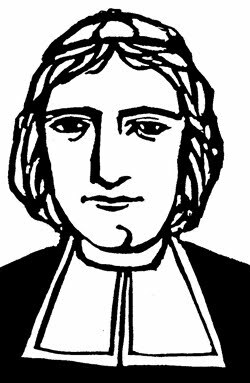 In 1791 he refused to take the oath of the so-called Civil Constitution of the Clergy and clandestinely exercised his priestly ministry, putting his life in constant danger." 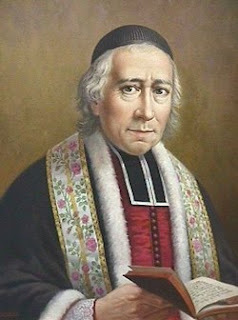 Since that time, we have seen many try to capture the spirit and charism of Blessed William Joseph Chaminade in every word, look and gesture. Now take a look at this contemporary attempt to capture the mission and vision of Blessed William Joseph Chaminade. This past week we were able to offer our prayers for the bicentennial jubilee of the Society of Mary and the Daughters of Mary Immacualte. Arriving at our three schools was the Bicentennial icon of the Wedding Feast at Cana at the Marianist Province of Meribah. 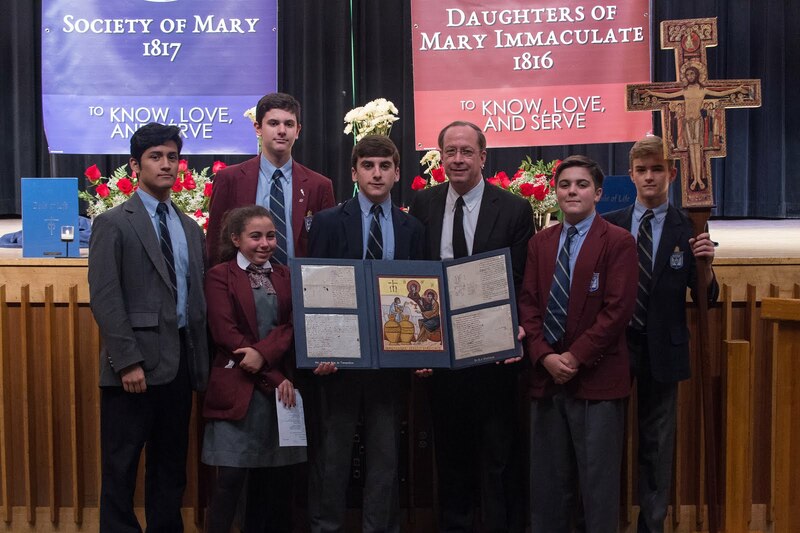 The icon, commissioned by leadership of the Society of Mary and the Marianist sisters, the Daughters of Mary Immaculate, traveled to Chaminade, Kellenberg, and St. Martin's with original letters from Marianist Founder Blessed William Joseph Chaminade and Venerable Adele de Trenquélleon, founder of the Daughters of Mary Immaculate. The letters were written by the two founders during the time of their work. 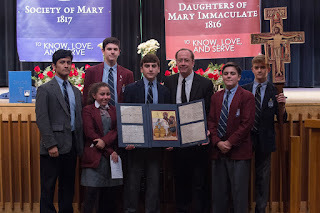 The Society of Mary's apostolate of education draws inspiration from Mary's words – preaching the joy of a Christian life under her protection. 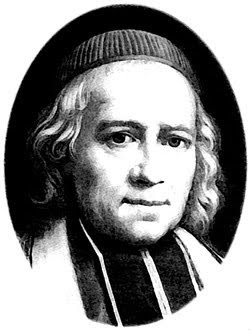 Blessed Chaminade began this mission by forming and dedicating himself to "sodalities" in France – groups of lay men and women learning how to be Christian in a new society. Bro. 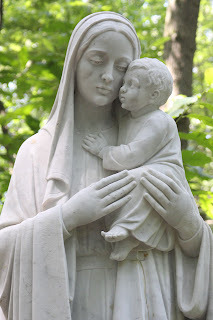 Timothy S. Driscoll, S.M., provincial superior for the Province of Meribah, said, "We are truly blessed to reflect together on Mary's message, and Fr. Chaminade's manifestation of it, during our bicentennial year. 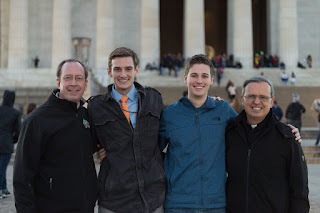 It reminds us of the privileged task given to us as Marianist educators and rekindles our zeal for the sacred task of making Jesus and Mary known, loved, and served in all places." The Bicentennial Icon - Bro. Salvatore Santacroce. As a special celebration of our charism during the bicentennial, a uniquely Marianist icon is traveling the Marianist world.The icon triptych includes a depiction of the wedding feast at Cana created by an Italian Marianist, Bro. Salvatore Santacroce. The Bicentennial Icon and artist reflection is posted belwo. As a special celebration of our charism during the bicentennial, a uniquely Marianist icon is traveling the Marianist world. The icon triptych includes a depiction of the wedding feast at Cana created by an Italian Marianist, Bro. Salvatore Santacroce. 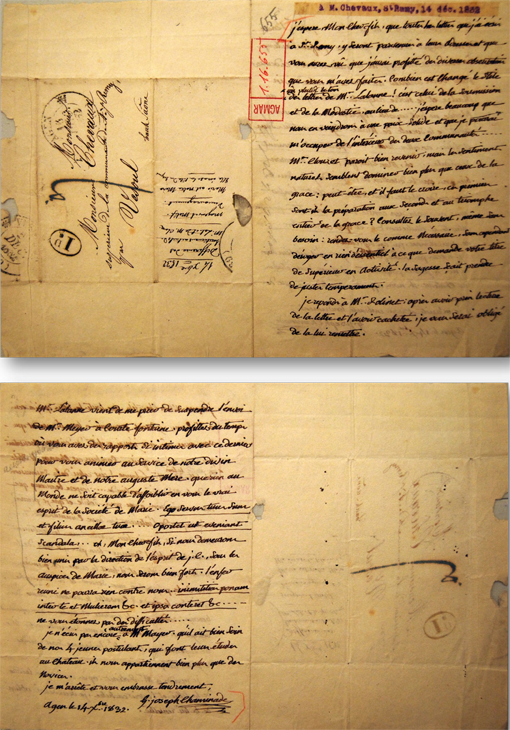 Flanking the art are original letters penned by Venerable Adèle de Batz de Trenquelléon and Blessed William Joseph Chaminade. The Blessed Chaminade letter and translation is printed below. I hope, my dear son, that all the letters that I have written to St. Remy have reached their proper addresses and that you have seen that I profited by the various observations that you made to me. How much the style, or, I should rather say, the tone of Father Lalanne’s letters has changed! It is that of submission and modesty in place of etc … I hope very much that we shall come to a solid peace and that I shall be able to occupy myself with the inner life of the two Communities. Brother Clouzet appears to be making a good comeback, but the natural sentiments seem to dominate a lot more than those of grace. Perhaps, and it must be assumed that these first are a preparation for the second and for the complete triumph of grace? Consult him often, even if there is no real need for it. Make yourself, as it were, necessary to him, without, however, detracting from anything essential to your office. Wisdom knows how to follow middle courses. I am answering Father Rollinet. After having read the letter and sealed it, will you please give it to him. Oh, my dear son, if we remain firmly united by the direction of the Spirit of Jesus Christ, under the auspices of Mary, we shall be very strong and all hell will be capable of nothing against us. Inimictial ponamiter te et Mulierem, etc., et ipsa conteret, etc. Do not be surprised at difficulties. I do not yet write to Father Meyer in any other vein. Let him take good care of our four young postulants who are studying at the château. They concern us more than the novices. to accomplish Mary’s mission in our world today. 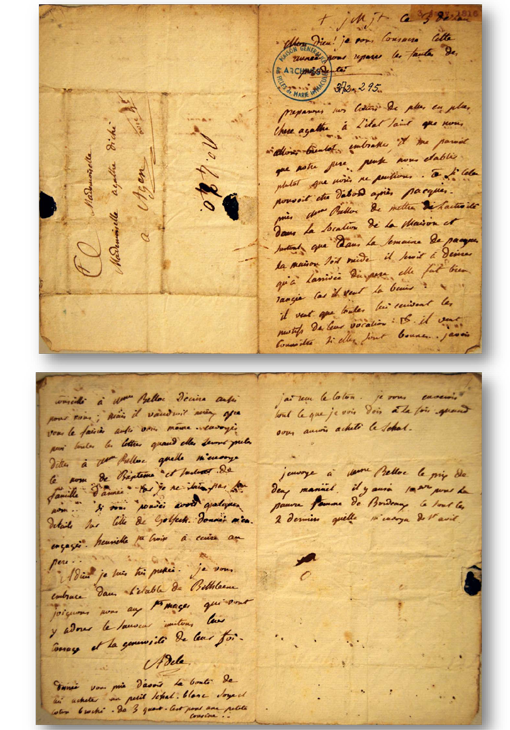 The Adèle letter with a translation is printed below. O my God, I consecrate this year to you in reparation for the failings of the past ones. Let us continue to prepare our hearts, dear Agathe, for the holy state which we shall soon embrace. 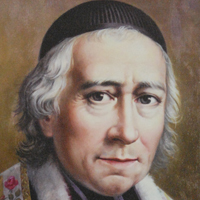 It seems that Father [Chaminade] intends to establish us sooner than we expected. If only this could be right after Easter! Ask Mme Belloc to hurry with the leasing of the house, and see to it especially that the house will be empty of occupants by Easter week. I think the arrangements should be complete before Father arrives, for he intends to bless the house. He wants each one to give him in writing the reasons for opting for the religious state, etc. He wants to know whether all are properly motivated. I had asked Mme Belloc to write on your behalf, but I think it is better you do that yourself. Send me all the letters when they are ready. Ask Mme Belloc to send me both the baptismal name and the family name of Aimée, for I do not know them. Should you have any details about the young lady from Golfech, please let me have them. Encourage Henriette de Sainte-Croix to write to Father. Farewell. I am in a hurry. I embrace you in spirit in the stable of Bethlehem. Let us join the holy Magi who are going there to adore the Savior. Let us imitate their courage and their unselfish faith. Désirée asks you kindly to buy her a small white shawl, of brocaded silk and cotton, about three feet long. It is for a second cousin of hers. I have received the cotton. After you buy the shawl, I will repay whatever I owe you. I am sending Mme Belloc money for two Manuals; that leaves 50 centimes for the poor woman of Bordeaux. Those were the last two that she sent me from Saint-Avit. John the Baptist comes from the quiet and peaceful desert. He calls us to REPENT. He tells us to go beyond the mind that we have. Change your way of perceiving the world. Stop thinking about your life as your project! Start thinking my life belongs to God and serves God’s purposes. All of our diversions and attachments are subservient to the basic position that my life is about God. My life is not a project of self-satisfaction. Get a whole new attitude in you. The new attitude is; no my life is not about me. We call yesterday's feast "Epiphany," the Greek word meaning "manifestation." On this great feast, Christ is made manifest to the world, in a place we might never have expected. But our lives are made up of countless smaller epiphanies -- discoveries that also defy expectations, and that can sometimes shed light on our world, just as the star shed its light on Bethlehem. God is made manifest everywhere. This time of year, His grace is revealed to us in the faces of our students...in the smiles of our families...in the comfort of having those we love close to us. And the epiphanies explode around us. The epiphany of sharing a story...a friend sharing a joke...a student sharing fears or hopes or secrets. There is the epiphany of having someone shake your hand in welcome and friendship. And there is the awesome epiphany of all: preparing to behold a slender piece of bread that is our Creator, and our savior. There is the epiphany of holding that -- and holding Him -- in the palm of your hand. Like the magi, we are all searching. We are all searching for God. And we are all magi bearing a gift with something to offer. We are all journeying toward an unknown place of promise, guided by a never-ending light. We are not guided by our GPS, although that can be very handy. We are guided by something greater. And that light assures us of this: if we follow it all the way, no matter how strange the road or unfamiliar the map...we will never be lost. Listen to this fine performance by the Godwin High School Madrigals, under the direction of Sherri Matthews, and their stunning rendition of We Three Kings, arranged by Darmon Meader. It's pretty obvious that St. John the Baptist knew who he was. John knew his purpose. He understood his mission. Diversions and attachments placed aside, he was able to verbalize his mission in clarity. He shouts, "I baptize with water;but there is one among you whom you do not recognize, the one who is coming after me, whose sandal strap I am not worthy to untie." From the quiet desert he understood. A VehJohn is able to tell us that the first step in the spiritual life is simple: you must see your life not as your own project but as a vehicle for God's purposes. However, we are all absorbed in our own lives, forgetting that the road to God is one of self-forgetfulness. This disposition helps us to focus on Christ and his mission. But in order for us to do this we must be cleansed of all attachments and baptized in the fiery love of God. Consider for a moment Blaise Pascal, the great philosopher. He tells us that much of our life is taken up with diversions and distractions. We distract ourselves from the really fundamental questions. Think of all the things we are preoccupied with on a day-to-day basis. Only when those are set aside, Pascal said, the really great questions emerge. And attachments…wealth, power, pleasure and honor being the big four. These attachments are shouting at us and luring us, tempting us all the time. We have to go into a silent and deserted place in order to hear. A place where the attachments and diversions are set aside. That’s why spiritual people have an instinct for a silent and deserted place. To begin the year by recalling God’s goodness in the maternal face of Mary, in the maternal face of the Church, in the faces of our own mothers, protects us from the corrosive disease of being “spiritual orphans”. It is the sense of being orphaned that the soul experiences when it feels motherless and lacking the tenderness of God, when the sense of belonging to a family, a people, a land, to our God, grows dim. This sense of being orphaned lodges in a narcissistic heart capable of looking only to itself and its own interests. It grows when what we forget that life is a gift we have received – and owe to others – a gift we are called to share in this common home. 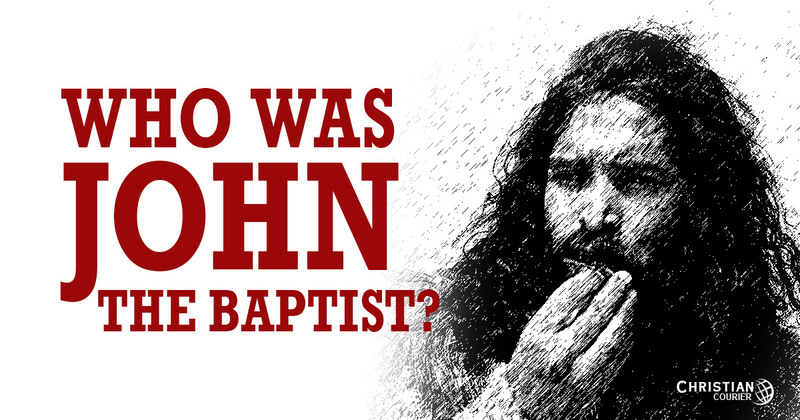 On Monday we heard proclaimed from the Gospel of John the identity of St. John the Baptist. John made his appearance as a preacher in the desert of Judea. I was in the Judean desert a couple of years ago and it was one of the most powerful places I have ever visited. It’s something about the beauty, but also the starkness of that desert. What is it about deserts in the Scriptures? Moses spends years in the desert before taking up his work. Elijah sojourns in a deserted place at a crisis point in his ministry. Of course, the Israelites have to pass through the desert forty years on the way to the Promised Land. Jesus himself spends forty days and nights in the desert before beginning his public work. And, of course, at the beginning of the Christian movement, monks sequestered themselves in caves and primitive shelters in the desert. What is it about deserts? Well, deserts are places of simplicity and poverty. Everything is stripped down to the basics. Places where distraction and attachments are eliminated. And both of these are important. 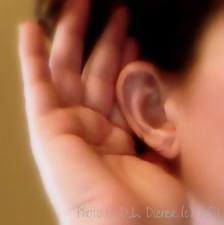 Because only when you eliminate distractions and attachments can you hear the voice of God. Have you ever gone through a spiritually dry time in your life? Call it a spiritual funk. Call it the spiritual blues where life is dull and going through the motions of a daily routine doesn’t really bring much satisfaction. Have you ever felt your prayer life meaningless and all the pizzazz has gone? Do you ever fear there might be something wrong with your spiritual walk with God? Maybe you are filled with questions and doubts leading to feelings of uncertainty which makes you doubt yourself even more. During times of spiritual dryness, the enemy will try to convince us we are all alone in this. No one else but you is having this problem. You never hear other Christians talking about spiritual dryness now do you? There must be something wrong with me, or I must be doing something wrong, and if I could just find the right stuff to add to my spiritual disciplines or attend the right retreat, I could fix this thing. However, the reality is, spiritual dryness comes, and it simply may be a clue it’s time for you to slow down and re-evaluate what’s happening in your life. Here is your opportunity to take a spiritual time out and refresh yourself. It just takes 24 hours. Go ahead and try it. With a shared charism and an inborn devotion to community, it is fitting that Marianist religious celebrate their bicentennials together. The vowed sisters, brothers and priests of the Family of Mary invite you to join them in this joyful, prayerful commemoration. The bicentennial celebration runs from May 25, 2016, until Chaminade Day, January 22, 2018. The celebration theme is three verbs that are omnipresent in Marianist text and tradition: To know, love and serve. These words encompass the dynamic of Marianist spiritual life: To know, love and serve Christ. To know, love and serve Mary. To know, love and serve the Marianist charism. We hope these words will enlighten and enliven the initiatives and events of the bicentennial celebration. Urged by his Mother into the reality that awaits him, Christ looks beyond the immediate, seeing his “hour” in the water that turns red and with cup and bread on the table, which anticipate and foreshadow his sacrifice. The servant fixes his astonished gaze on Christ and comes to a new enlightenment that, through faithful obedience, is able to welcome the eruption of Divine Power within human reality. “Mary treasured all these things and pondered them in her heart! (Lk 2:19). In these words, Luke describes the attitude with which Mary took in all that they had experienced in those days. Far from trying to understand or master the situation, Mary is the woman who can treasure, that is to say, protect and guard in her heart, the passage of God in the life of his people. Deep within, she had learned to listen to the heartbeat of her Son, and that in turn taught her, throughout her life, to discover God’s heartbeat in history. She learned how to be a mother, and in that learning process she gave Jesus the beautiful experience of knowing what it is to be a Son. In Mary, the eternal Word not only became flesh, but also learned to recognize the maternal tenderness of God. With Mary, the God-Child learned to listen to the yearnings, the troubles, the joys and the hopes of the people of the promise. With Mary, he discovered himself a Son of God’s faithful people. In the Gospels, Mary appears as a woman of few words, with no great speeches or deeds, but with an attentive gaze capable of guarding the life and mission of her Son, and for this reason, of everything that he loves. She was able to watch over the beginnings of the first Christian community, and in this way she learned to be the mother of a multitude. She drew near to the most diverse situations in order to sow hope. She accompanied the crosses borne in the silence of her children’s hearts. How many devotions, shrines and chapels in the most far-off places, how many pictures in our homes, remind us of this great truth. Mary gave us a mother’s warmth, the warmth that shelters us amid troubles, the maternal warmth that keeps anything or anyone from extinguishing in the heart of the Church the revolution of tenderness inaugurated by her Son. Where there is a mother, there is tenderness. By her motherhood, Mary shows us that humility and tenderness are not virtues of the weak but of the strong. She teaches us that we do not have to mistreat others in order to feel important (cf. Evangelii Gaudium, 288). God’s holy people has always acknowledged and hailed her as the Holy Mother of God. To celebrate Mary as Mother of God and our mother at the beginning of the new year means recalling a certainty that will accompany our days: we are a people with a Mother; we are not orphans.